Description: NS 220 works Inman. Description: CN 9606 leads a sulphur train out of Steelton through Nopeming Jct. Description: Westbound on track two as a railfan gets a shot of the EMD power rather than the Dash 9. Description: 64R rounds the curve by the Freemansburg Motorcycle Hill Climb location as it heads towards Jersey. 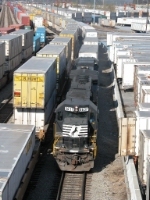 Title: NS 12R NS 6637 with Up on Train! Description: Northbound at creek yard with a manifest train to go up the D&H. Title: NS 11R NS 6637 Packer St. with UP 4669 on train. Description: Two SD60s lead 236 through Wytheville. Description: Freshly rebuilt from long hood front. It now has the F's on the short hood, a new control stand on the right side of the cab, anti slip rubber flooring, A/C and speaker/handset for the conductor. Description: ......and I thought I was done for the day! !